This interview also raises several other questions. The General still claims overall command responsibility for what took place ‘as he supervised the final stages of the war’, but he declares that he had no information about this incident until he received it from journalists. The interview does not mention when this information was received, whether it was before or after the July 10th speech in which he is said to have taken responsibility for an incident that had only been vaguely mentioned previously in Tamilnet and other such sources. There is no explanation as to why Gen Fonseka did not act on the information he received until an interview designed to promote his political career. Understandably the person who interviewed him did not think it necessary to ask such questions. Indeed the person who conducted this part of the interview was not clearly indicated, though the Editor informed us that she did it herself. Inside the paper there is the text of an interview that seemed to have been given by Gen Fonseka to a reporter who belongs to the family of the leader of the opposition, but it seems that that interview too was conducted by the Editor. The separation of the two sections of the interview seems strange, but we were assured that this is common journalistic practice. Understandably then the interview is not clear about where Gen Fonseka was when the purported incident took place. There are stories that he was in fact in China during the final stages of the war, but it is still claimed that he supervised the final stages. If he was not here, then it is understandable that decisions were reached without him, including implementation of the brilliant tactics that ensured the freedom of the tens of thousands who flooded out to safety in the week before the purported incident. But one would have expected that, when he got back to duty, whenever that was, he would have inquired about what had taken place in his absence, and in particular dealt with important issues. Nothing of that sort seems to have happened. Instead he seems to have concentrated in the week after the victory in trying to catapult the government into expanding the army by enormous amounts. Had he succeeded in that aim, doubtless we would have heard nothing of the current claims, and there would have been no intimate revelations to such journalists. But the government was quietly, and privately, firm in its resistance to unnecessary additional expenditure that would not have sent the right message to the nation or the world. And so we are subject now to selective revelations that were earlier presented as part of a personal military triumph. If not for the sake of the army, if not for the sake of an accurate response as pledged to the State Department report, if only for the sake of Human Rights for the future, it is desirable that the General be questioned closely now on how he responded to the rumours that were circulating. It is to be hoped too that, contrariwise, such matters will in the future be dealt with in a more consistent and principled fashion. Fonseka said at an event held in Ambalangoda to felicitate him on July 10, 2009. 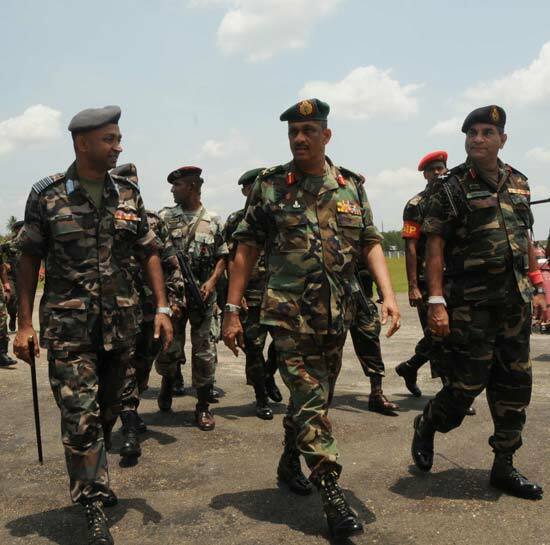 The repeated critique of those ‘in air conditioned rooms‘ seems a reference to the Secretary of Defence, which suggests that Gen Fonseka wished to take all credit himself, before this particular audience, for ignoring the ‘ messages not to shoot those who are carrying white flags‘. He did not mention at that stage who sent him these messages which he belittled in his effort to declare that ‘We destroyed any one connected with the LTTE. That is how we won the war‘. It is clearly necessary to investigate which of these various claims is pure fantasy, tailored to particular audiences, and which if any have any grain of truth. Both cannot be true, but it is possible that both are false. And in fairness to Gen Fonseka it should be noted that perhaps he said none of these things. In July a website that now supports him strongly was determined to attack him so it could well have attributed to him a self-incriminating boast that was very far from what he said. And, given the provenance of the current claim, he could well have been misquoted now, in what seems to be a cut and paste job, combining lots of stories that were circulating on Tamilnet and similar sources in May, with perhaps only a single loose statement by the General.